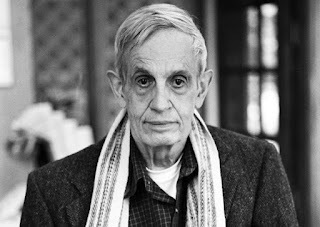 John Forbes Nash Jr. was a brilliant mathematician and a suffer of something, depending on whom you ask, in the neighborhood of schizophrenia and manic depression. Nash, who died in a car accident with his wife a little more than a week ago, was, first and foremost, a Nobel laureate, whom, like many mathematicians, made his greatest discoveries in his 20s (As G.H. Hardy wrote in 1940, of “all the arts and sciences mathematics is the most remote” and “no mathematician should ever allow himself to forget that mathematics, more than an other art or science, is a young man’s game”). Knowing that history and those peculiarities of mathematics and mathematicians, strange behaviors –extended solitude, writing equations on walls, a frenetic pace to develop solutions, mumbling to themselves in public – probably did not seem so far outside the norm among his brethren at Princeton University. But, according to a 2010 edition of The Princetonian, the daily newspaper at Princeton, Nash was an eccentric among eccentrics. 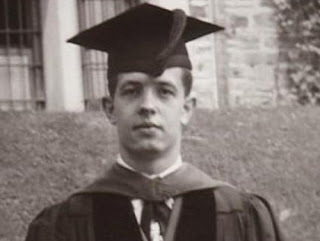 The newspaper said that Nash, as a student, became known as “The Phantom of Fine Hall,” a shadowy figure who would scribble arcane equations on blackboards in the mathematics building middle of the night and the walls of toilet stalls during the day (it says something mathematicians at Princeton that this was not considered a prime facie case for mental illness). Nash’s mental illness, as it was identified at least, first began to manifest itself as erratic behavior and then paranoia. First, there was the communist conspiracy against him. He mailed letters to embassies in Washington, D.C. declaring that the communists were declaring a government. Then, there were the aliens. And, finally, his psychological battles broke into his professional life at an incomprehensible lecture he gave at Columbia University in 1959. That year, Nash was admitted into McLean Hospital in Belmont, Massachusetts and was diagnosed with paranoid schizophrenia (although, his biographer, Sylvia Nassar, writes that his likely actual diagnosis may actually be bipolar disorder, or manic depression, with psychotic features). There, doctors discovered, that Nash was not just suffering from paranoia, but also auditory and visual hallucinations – essentially perceptions of things that were not actually there. In 1961, he was hospitalized again in a state hospital in Trenton, New Jersey. Nash was placed on medications and never hospitalized again. Or so goes the premise of the 2001 movie that was made about him, starring Russell Crowe, called “A Beautiful Mind.” Those of us who suffer from mental illness and accept treatment want to believe that we can have the brilliance, the beauty without the madness. There is no empirical evidence to suggest that preserving brilliance while in treatment is impossible. But Nash's story certainty does not make the case. The popular convection of Nash’s story is about the connection between brilliance and madness, and it gives hope to those whose creativity and intelligence appear linked to their mental illness. It screams that you have both sanity and brilliance. I believe that it is possible – but it’s hard to not look at Nash’s story, and those of many others in similar positions, and think that you might just have to give up a little of one of those things for the other. The truth is Nash never really took to medications, and said that he would only take them under extreme pressure. In 1978, Nash won the John von Neumann Theory Prize for what is now called the Nash Equilberian (in 1994, he won the Nobel for game theorem work he developed while a student at Princeton). But Nash likely never found an equilibrium between brilliance and madness in his own life. I remember watching the movie for the second time with a friend who had been diagnosed with manic depression. This creative friend had struggle with her diagnosis. By the middle of the movie, where the viewer begins to realize before the character of Nash in the movie that he is not truly being hounded as a part of a vast government conspiracy, she began to cry. When we discussed those tears, it was sadness both for the character on the screen and for how the movie broke the dichotomy that we so easily construct with brilliance in one place and madness far away on the other side. It is easy to listen to the stories of Winston Churchill, Sylvia Path, Van Gogh and Mozart, and believe that, now, with medications there is hope to find a way to intermindle, to tam the madness that so often comes with brilliance without snuffing out that spark. What makes Nash's life so painful for me is that it does not provide any clear answers about the interconnections between brilliance and madness or whether, as some have argued, that people like him can have one without the other. It does not make the case I want it to make -- that you can be in treatment and still be brilliant. Hearing Nash speak several years ago at the University of Maryland at College Park struck me in a number of ways -- one of them particularly relevant to this discussion. Nash was discussing game theory. And, I and those around me, including leading mathematicians of the day, did not understand a word he said. In our group that day, we all thought that it was simply because his mind operated on a different plane than ours -- that we just were not smart enough to understand it. Now that I better understand his life, I wonder whether it wasn't just that he was so brilliant that we did not understand him. Perhaps he was just so mad that we could not understand him.